SportsArt Fitness, an industry leader in the design, development and manufacture of premium quality home exercise equipment, is pleased to announce that not one, but three, of their latest innovations have been awarded top honors in the 2006 Health Magazine 'Best of Fitness' Awards. 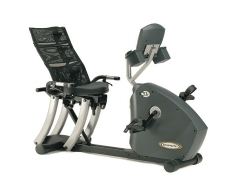 Chosen by a panel of independent judges, who tested over 1,000 products to come up with the year's best, the C51r garnered the award for the best stationary bike under $1,500, the C53r was named the best stationary bike over $1,500 and the X-Trainer, a dual-action total body exercise machine, took home honors for the most innovative fitness equipment. "We are incredibly honored to be recognized by a publication as prestigious as Health Magazine," said Scott Logan, Director of Marketng for SportsArt Fitness. "Winning three awards is amazing but, beyone that, it really validates our company wide philosophy of building innovative products. Thanks to Health for helping aducate the public about high wuality fitness equipment and thanks to our engineers and design team for bringing these terrific products to market." Winning products were chosen based on criteria that included: quality, ease of use, and innovation. Both the C51r and C53r were praised for their convenient step-through design and superior programming, while the X-Trainer was penned as "ingenious" for its independent upper and lower body resistance options. SportsArt Fitness is an industry leader in the design and manufacture of high quality cardiovascular fitness equipment for home and commercial use. SportsArt retains control over every aspect of component design and the overall manufacturing process ensuring proper integration, maximum performance and longer product life. In addition to TUV ISO 9001/9002 quality certifications, SportsArt products have garnered numerous awards from top-flight media outlets including Men's Journal, Men's Health and Health Magazine among others. For more information on the SportsArt Fitness brand and their latest products visit us on the web at www.sportsartfitness.com.